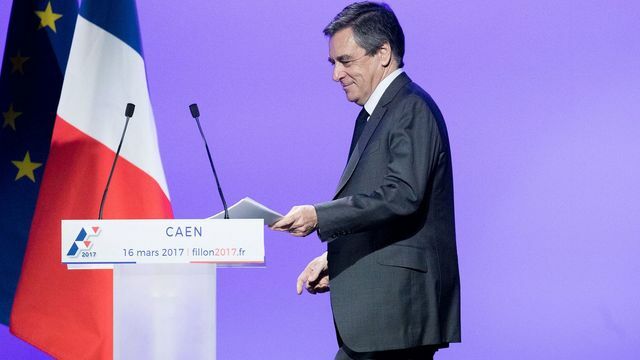 François Fillon’s strategy of claiming to be the victim of a conspiracy engineered by the judicial and political establishment to derail his campaign is a bold, if desperate, attempt to salvage his shot at the presidency. His victory appeared a fait accompli when Donald Trump, who has since made similar allegations against his predecessor, took his own presidential oath in January. Days later, however, his lead began to disintegrate. Fillon’s numbers tumbled as revelations that he had made enormous payments to family members for little-to-no work emerged in the press. Fillon has defended the arrangements, which do not square easily with his prescription of austerity and longer working weeks for French workers. By March, his support flatlined, stabilising at around eight points behind centrist Emmanuel Macron. This is an unprecedented election in modern French history. Both of the traditionally dominant parties chose anti-establishment candidates who represent the ideological extremes of their respective parties, and yet both are being outperformed in polls by more extreme candidates in the form of Marine Le Pen and Jean-Luc Mélenchon. Even moderate Macron, who is considered to present the safest bet by investors and concerned EU officials, is an independent who cloaks business-friendly policy in anti-establishment rhetoric. So there's method to Fillon's madness; railing against the establishment is an intuitive strategy in a campaign where the public’s frustration and anxiety have already transformed the political landscape of France. Accusing the Socialist president himself rallies his conservative base and speaks to widespread distrust of political elites. Is it working? Probably not; a new Elabe poll shows that last week Fillon gained a point as Macron lost two, but these variations are well within the margin of error. Les Republicains’ last-minute attempts to remove him failed, but demonstrated his party’s panic, as they risk their traditional base being pulled apart by the appeals of Le Pen and Macron. Apart from Le Pen, who has solidly maintained support in the mid-to-high twenties for a year, every candidate’s constituency appears fragile, seemingly underpinned only by their dislike of the other options. Le Pen may have fancied her chances against the hapless François Hollande, but this unexpected slate of rivals presents a greater opportunity. In any other year, the two-round election system would be her greatest obstacle. Now, if the second round becomes a contest to leverage economic and social anxiety, the populist could defy the polls and rout a more moderate opponent, especially one as damaged and desperate as Fillon.